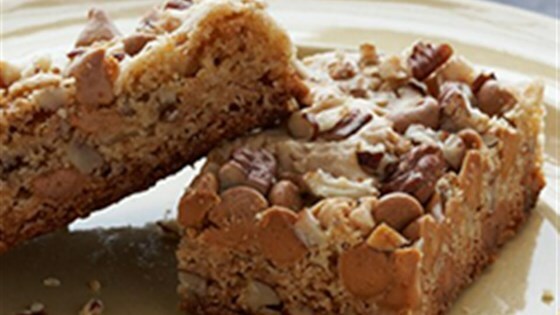 "Enjoy the wonderful butterscotch flavor and satisfying crunch of pecans in these Butterscotch Bars, cleverly made with Duncan Hines French Vanilla Cake Mix. It's easy, tasty and fun to share." Preheat oven to 375 degrees F. Grease 15 1/2 x 10 1/2 x 1-inch jelly-roll pan. Combine cake mix, eggs, melted butter, brown sugar and vanilla extract in large bowl. Beat at low speed with electric mixer until smooth and creamy. Stir in butterscotch chips and pecans. Spread in pan. Bake at 375 degrees F for 20 to 25 minutes or until golden brown. Cool completely. Cut into bars. A divine treat with layers of sweet cream cheese and butterscotch! I added mini chocolate chips as I didn't have the right amount of butterscotch chips. It turned out delicious. My kids loved it too. I drizzled smuckers caramel sauce on top. I made these as directed only used half butterscotch and half chocolate chips. Also added minced pecans. Baked for 20 minutes only. Outstanding! I made these for a charity bake sale and they all bought in a short time. People came back and bought seconds. Didn't change a thing except I used Betty Crocker French Vanilla, store did not have Dunkin Hines. Super easy, very sweet.